Green Bag America is happy to address product or company related questions, concerns, or feedback. Here you will find some answers to some frequently asked questions that our company receives. Q: What makes your bags eco-friendly? ANSWER: Our bags are made of recycled plastic with a chemical called C3H6 (mix of hydrogen and carbon atoms) added to it making it more durable and break down faster than regular plastic. ANSWER: 8-10 weeks after your artwork is approved. Q: What are your bags made of? ANSWER: Most of our bags are made of polypropylene, but we are bringing on new materials. Currently we have Natural Jute and Cotton Canvas bags. Q: Where are our bags produced / manufactured? ANSWER: Our headquarters are in Northridge, CA, but we have an office in Israel and we own a factory in China. Q: Do we have other bag styles? ANSWER: We can custom make bags to whatever the customer needs. Q: What color bags are available? ANSWER: We have a standard color palette, but if we don’t have the exact color they need, we can match their color for an additional fee. Q: What types of printing styles do we offer? 1. Silkscreen (show pricing includes 1 color) – Screen printing is a printing technique where a mesh is used to transfer ink onto the bags, except in areas masked out, making it impermeable to the ink by a blocking stencil. 2. Heat Transfer – the technique of printing fabric by transferring a printed design from paper to fabric by way of heat and pressure, similar to iron-ons. 3. Full Color – a printing process that combines four colors (cyan, magenta, yellow and black) to create full color images, commonly referred to as “CMYK”. Q: Can I print on all four sides? ANSWER: Yes, there will be an additional set up fee of $35 and an additional $0.06/bag. Q: Does Green Bag America offer customizable products? Can products be designed with personalized business and fundraising logos? ANSWER: Green Bag America aims to serve every small and large business owner or organization by providing complete customizability. Please note that our customized orders require that you place an order of no less than 3000 bags. 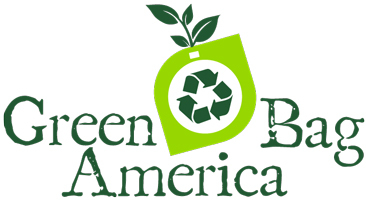 Q: What is the cost associated with shipment of Green Bag America products? ANSWER: Shipping estimates are approximate and based on commercial addresses. We make every attempt to offer you the lowest possible shipping costs — we want you to be willing to rely on our green bag products with as little expense to you as possible. If there is a cheaper way we will use it. Q: I hear that green bags are supposed to be superior products when compared to standard plastic bags, but what is it that makes green bags better than plastic bags? ANSWER: Standard plastic bags are disposed of and take a tremendously long time to biodegrade. In fact, disposable plastic bags make up as much as 22 percent of the solid waste created today. What’s worse is that when plastic bags are disposed of, they are buried or get no sunlight exposure. It can take four centuries for the bags to completely biodegrade. Today’s disposable plastic bags are often manufactured from petroleum which is adding to how many fossil fuels are being consumed. Green Bag America is making bags that are eco-friendly, recyclable and the bags are made from 100 percent polypropylene so they are not a hazard to the environment. In addition, green bags are an affordable option for businesses both small and large looking to implement some environmentally friendly actions and to improve their company image. Q: I hear paper bags are better than plastic bags so why not use paper and forget about plastic bags altogether? ANSWER: While it is true that paper bags are far more biodegradable than today’s traditional plastic bags, using paper bags causes manufacturers to kill off more trees. Trees are not being replaced as fast as they are being used as a resource; as a result, the world is losing out on trees that filter out carbon dioxide from the atmosphere and produce life-giving oxygen. In addition, creating paper bags from trees requires that manufacturers rely on the use of millions of gallons of water; another resource that we cannot do without. Our green bags do not rely on trees or water, and they are made of ingredients that are eco-friendly. Q: Why are paper bags not such a great idea? (a.) – Our green bags use 40 percent less energy to manufacture when compared to paper bag manufacturing methods. (b.) – Our reusable green bags produce 80 percent less in terms of solid waste production when compared to the waste created by the creation and use of paper bags. (c.) – Paper bags are often not recycled and they can generate 70 times more pollutants that affect our air quality overall. Our green bags are far more eco-friendly. (d.) – Our reusable bags are bigger stronger and easier to carry then any paper or plastic bag. And of course when you sell them you increase your profit and save money on paper and plastic bags. Q: How do using green bags provide a solution to our current solid waste production problem? ANSWER: Green Bag America seeks to educate the public, increase consumer Green IQ, and to encourage the reusing of green bags and the recycling of Our Green Bag Products. Our company is reaching out to everyone we can to encourage the world to make changes that will help our environment – one small step at a time. We encourage the use of recycling bins and the act of recycling glass, plastics, cardboard, newspapers, magazines, and metals. We also encourage the use of reusable products. Q: Is there any profitability to be had through the purchase of green bags? ANSWER: Of course; our bags are not only functional, business owners find them attractive, colorful, and affordable as well. Our bags can be resold to consumers with an eco-friendly conscious and the profits return directly to the business offering our bags for resale! In fact, our bags can be sold for 4 times more than what a small or large business owner purchases them for. It will save you the costs of paper and plastic bags. Last but not least, it will act as a walking advertisement for your brand and will improve your public image.